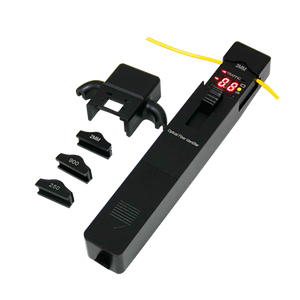 The SKYCOM T-FI350 Optical Fiber Identifier can quickly identify the direction of transmitted fiber and display the relative core power without any damages to the bended fiber. When the traffic is present, the intermittently audible tone is activated. The SKYCOM T-FI350 optical fiber identifier also recognize the modulation like,270Hz,1kHz and 2kHz .When they are used to detect the frequency, the continuously audible tone is activated. There are four adapter heads available: Ø0.25, Ø0.9, Ø2.0 and Ø3.0. 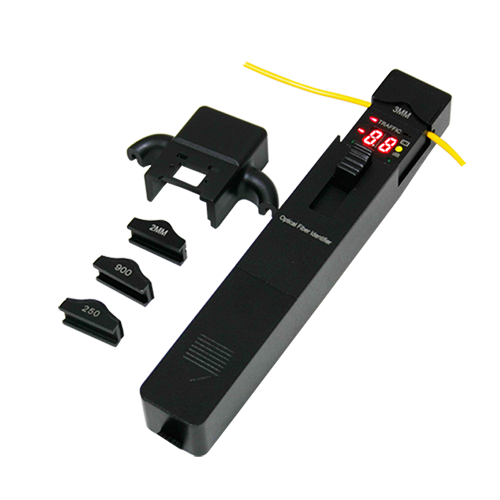 The optical fiber identifier is powered by a 9V alkaline battery. - Easy-to-use with “ONE KEY “operation. - Efficiently identifies the traffic direction and frequency tonel (270Hz, 1KHz, 2KHz) with audible warning. - Displays the relative core power. - More accurate test with Sunshade. - Durable metal housing and quality construction.